Being that it's super close to wedding season, and especially, THE wedding of the season (ROYAL WEDDING DER), I thought I would share these awesome late night wedding food ideas. ...and back to the matter at hand - adorable late night wedding food. After the dinner is over and you've danced all those calories away, why not serve up some of these adorable treats? I found these gems at Delish.com, one of my favorite sites. 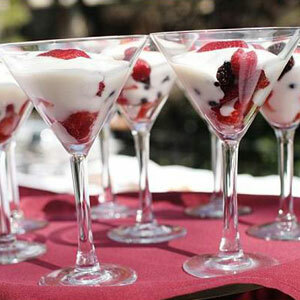 Individual parfaits are a great treat - any time of day! These would be perfect for a late night snack or a baby or bridal shower! Don't have enough martini glasses? Get the plastic ones from party city or rent glass ones from a local party rental store! 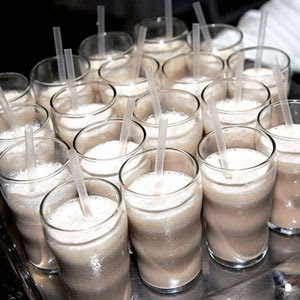 How about a mini milkshake...(your milkshake brings all the boys to the yard)....oh sorry about that - do you find that it's impossible to say or think the word milkshake without hearing that song in your head? McDonald's fries your favorite? Serve them as a late night snack! I personally have always thought McDonald's fries were the superior fast food french fry. If I saw them being passed around as a late night treat, I might just Mc-Cry from happiness. This is quite possibly my FAVORITE idea of all ideas. 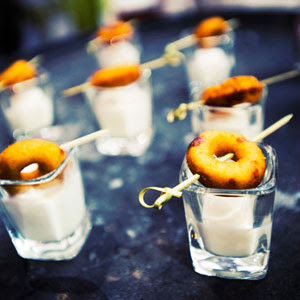 Mini donuts with shots of milk?! SO CUTE and who wouldn't want a donut at 11 p.m. I mentioned this idea to a bride I am working with, and she loved it! She even suggested using chocolate milk - clearly, she's a genius. For more glorious late night wedding treats, see the article at Delish.com. Another special touch? Arrange for a special treat from your hometown. For my wedding, my dad wanted to get authentic Italian pastries sent down to North Carolina from his favorite bakery in New Jersey. A special and delicious touch - although I must admit, I didn't see any of these pastries. I was too busy dancing up a storm - hey-o! Maybe Prince Wills and Kate will be serving mini tea and crumpets for their wedding festivities...more on tea and crumpets in tomorrow's royal wedding post. In fact, for a great round-up of royal wedding ideas, recipes and general royal commentary on the whole shebang, check out the blog tomorrow night. Cheerio! 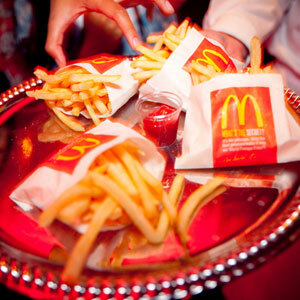 Love all the ideas, but totally diggin the MCd's fries!!! I love the mini donuts! This post is hilarious...and making me hungry...which is saying a lot since I just ate! Great ideas! Seems to be a very promising catering services ! Great catering is dependent on two factors: excellent service and unforgettably great food which I think you can provide both! It's simple to choose you want a designed marriage party. It's much more challenging to actually take it off, but the procedure really isn't as challenging as it might seem and the compensate of having a marriage you can look again on with satisfaction creates it value the attempt. very nice post. This is very useful to us. Thanks for sharing.